It was tied Mordin 4 Mamawolf 4 with Matev and my votes. Simply moving off would have done the same, but allow for a tie by another last minute person. I moved it to a 5 vote compared to the next few at 3. The word came down from on high in a text message sent to all the members of the Legion. The message contained just a single word, but they all knew what it meant. Someone was suspected of using an Object for their own purposes. And in these desperate times, the Legion could not afford to waste any time in removing a potential threat not just to the Legion, but to the entire world. There were many Objects of unimaginable power. If this person had one of them, and this person was going to use it to achieve some unknown end, then the Legion had no choice but to act swiftly. So, the Legion gathered their members together, and as one they went to confront their suspect: MamaWolf. The whole ordeal was over rather quickly; the Legion had become quite efficient at eliminating those who would abuse the power of the Objects. Alas, it was not until their grim work was done that they learned the truth: MamaWolf was no traitor, but a loyal member of the Legion. After the deed was done, however, the collected company realized there was someone who was missing. Someone who almost certainly would have put a stop to this: Green, one of the longest-serving and most loyal members of the Legion, was nowhere to be found. Then, as if the universe were taunting them, a breaking news report provided the answer to their question. Green’s lifeless corpse was found in an airport bathroom, a fresh gunshot wound in the middle of his forehead. The contents of their satchel were emptied on the bathroom floor, but investigators did not see that anything obvious was missing. The only item of note was a one-way plane ticket to Albuquerque, New Mexico. You can't take a wrong turn at Albuquerque if you never make it there in the first place. Only one kill huh? Either someone did a good job guarding someone or the village doesn't have a "good guy with a gun". Day Two begins now, and ends tomorrow at 9 PM EST. Kaplar stole my cuff links. Stealing=mafia? I didn't think that testing a mechanic would be seen that way. Anyway, does anyone know what happened to the items the people who died were holding? My assumption is that they're gone or belong to the person who what did the killing. I don't know how that would work for the vote target though. Ok, now Sir Fab is one day away from retirement. Didn't I break the tie onto Moridin? I didn't think there was anyone else on 3 at that point. Or was this the 2 piece tie on Kaplar? Who invited the Mad Hatter? The player order has changed again. 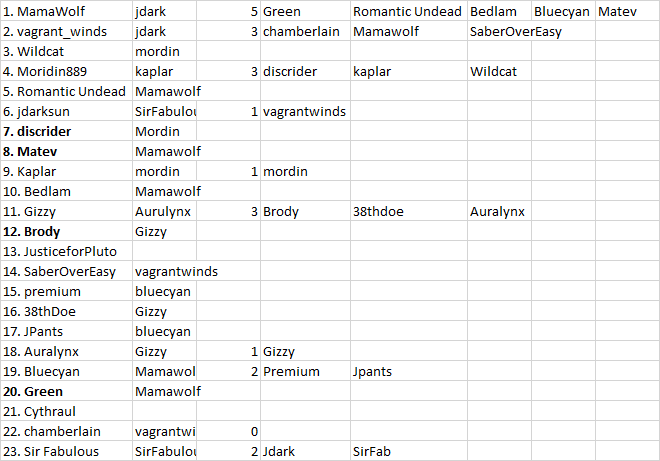 I mean, Blue's spreadsheet was showing that I had three votes on me and was part of the tie, but I only had two votes on me: SaberOverEasy and chamberlain. There was no reason to change my vote to protect myself even though I could have because I was active at vote close. Yup, that's my mistake, I had Mama's vote for Vagrant, but she had voted for Jdark. Sorry all, especially @discrider who was also unbreaking a tie. Sorry for the late arrival everyone, my wife left me directions to the Sunrise motel. I was up all night detailing the HELL out of Room 10 there. Didn't notice my mistake until this morning after a rather lousy continental breakfast. Did... did I end up in room 10 after all?? Turn order determines order of operations and it shifted from day 1 to day 2. It's actually really important with this game due to the number of powers and the general ability to steal. There is no room 10. You see, most hotels, you know, will be offering up ten. You're on ten here, all the way up, all the way up, all the way up, you're on ten in your room. Where can you go from there? Where? Nowhere. Exactly. What we do is ditch 10, if we need that extra push over the cliff, you know what we do? Room 11! Ours goes up to 11?! Its one more right?! Its better. Best hotel in the state. *shrug* I have no leads, and as I tell my kids stealing is grounds for death. I hope you don't have too many cookie jars. We don't have any. Those things are death traps. I keep my cookies in my safe. It has one of those locks from Resident Evil where it needs 17 different crests hidden across town in locked boxes that each require a metal chocolate chip to open. The exercise I get from getting a cookie and resetting the system balances out cookie binges. Pretty rude to do this to me when I'm gonna be out of your hair after tonight anyway. The way I see it, there are 5 ways we can do this. 5. End the universe itself. We could also kill Moridin. He seemed a bit suss. Ooh! We could kill everyone! Got nothing against the universe though. Do you always rely on the man to tell you what to think Cythraul? You believe any propaganda they spew at you? With one breath you admit to know about room 10, then, with another, you willingly ask to be subjected to groupthink! What's jdark got on you man? Free your mind, brother! Looking at Green's corpse, I'd dare say he was vigged, having tied the vote and posted minimally. So I think perhaps the mafia kill was blocked. Citing the championships seems like the kind of supposedly-helpful observation that a mafia scum might make. Cythraul, please respond extensively. He means the championships would have asked jdark for such a list at about ten minutes into the first day. You've fallen into my trap of misappropriating their meta for use in our meta!